Oh it's that time of the year again, in June the calender officially rolls into summer and what product epitomizes this warm season more than sunscreen? Having reactive and acne prone skin, sunscreen was never an easy task for me. It took many years of trial and error before I found out that I was reactive to a few chemical sunscreen ingredients, mainly avobenzone which would make me break out in rashes and spots. 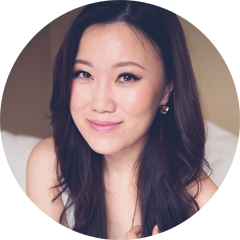 Thus I started looking into Asian sunscreens which mainly still used physical protectants such as zinc oxide and titanium dioxide as opposed to popular American brands. For the past two years I've made it a goal to try out a new facial sunscreen every summer. 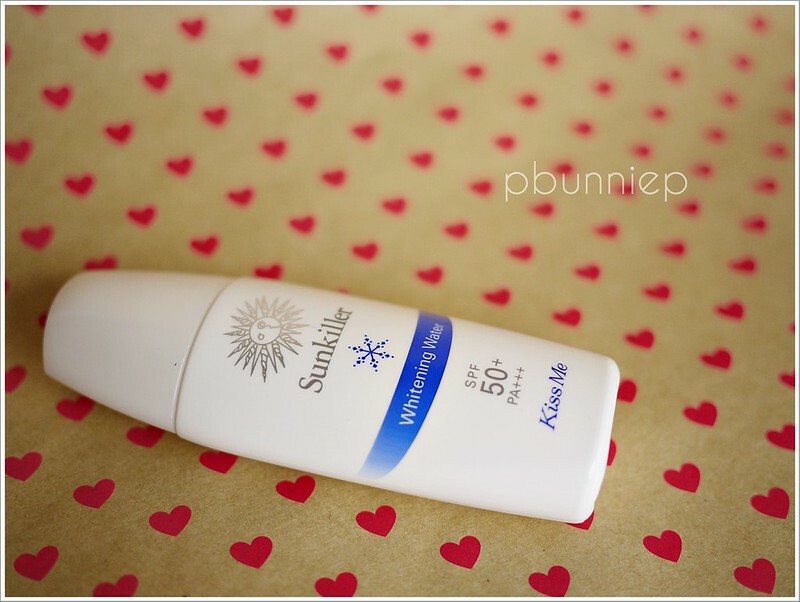 This SUNKILLER Whitening Water sunscreen was my pick last year when I used it throughout the warm weather and even occasionally in the fall/winter time. Features: Beauty essence ingredients, hyaluronic acid, vitamin E, waterproof, non-scented, no dyes. 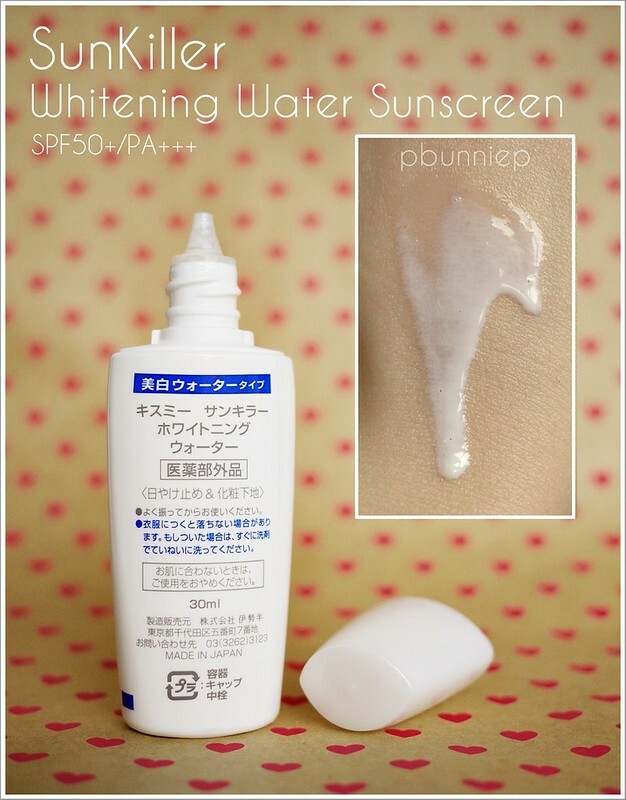 Let's start off with the simple things, this sunscreen has high SPF and is incredibly light in texture. As you can see from my swatch, it's a very watery formulation that spreads easily on the skin. As with many Japanese light waterproof face products, the bottle needs to be shaken up well before use so all the ingredients will mix together. If you don't, you'll end up with a layer of clear liquid and blobs of white sunscreen. Applied on the skin it can feel slightly oily at first (especially if you didn't shake well) but I find that the product absorbs and disappears into the skin within 2-5 minutes so even those with oily skin need not worry. Once dried, your skin will have a soft matte finish and whether you choose to wear foundation on top or not, it doesn't look like you have any excess product on your skin. In fact, I might even add that I feel my foundations wear slightly longer when I have this as a base. It's unfortunate that I forgot to save the packaging so I can at least provide the ingredients list (like I usually do) but from what I remember this a is mineral oil free product because my skin would have already reacted horridly by now which it hasn't, thankfully. As for the skincare ingredients, I do find that the hyaluronic acid and vitamin E additives prevented my skin from drying out during the day, however even with continued use I have yet to see any whitening improvements. I'd say that this is a very basic and gentle everyday sun care product that's great for continuous use for both men and women. The unscented factor will make it seem less girly plus it's small enough to pop into any makeup or shaving bag. High SPF factor with no noticeable white cast (however do note that I am on the paler side of the spectrum to begin with). Skincare ingredients keep skin comfortable, physical sunscreen protection. Super milky/light texture, non scented, no breakouts or adverse reactions even with daily use. 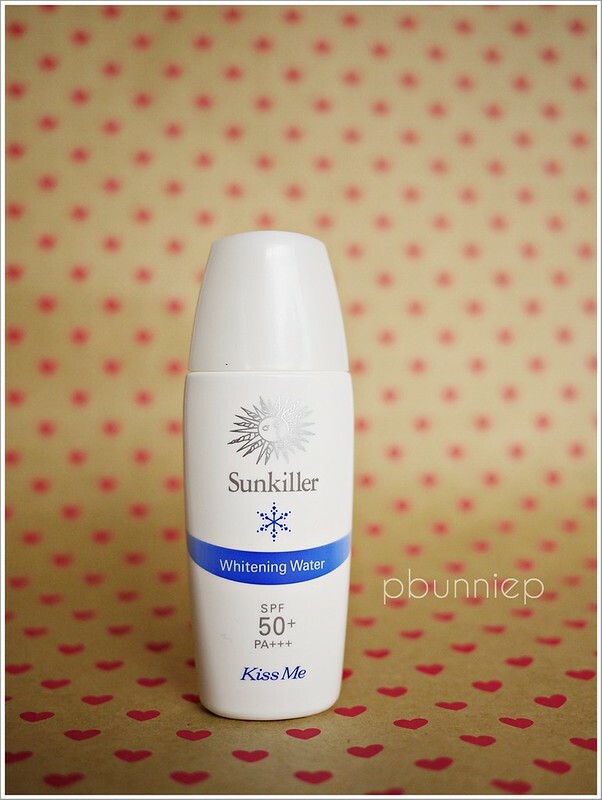 The SunKiller Whitening Water sunscreen is a popular product but can be hard to find if you live outside of Asia. 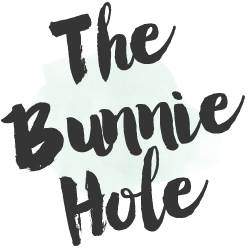 Try searching online Asian product shops or eBay to try it for yourself! Active Ingredients: Zinc Oxide (11.31 W/W%), Ethylhexyl Methoxycinnamate (9.00 W/W%), Ethylhexyl Triazone (0.5W/W%), Benzophenone-3 (0.5W/W%). I'd say it should last at you 2 months or so if you wear it daily. I didn't wear this sunscreen everyday since I other times I would try different ones but overall, you really don't need a whole lot for each application. I adore double duty products, I mean why shouldn't makeup/sunscreen do a little extra for your skin? It's certainly one of the reasons that I'm attracted to Asian products, they seem to be much more focus on multi-functional products. Usually when I use a sunscreen, it will flake when I apply my foundation, somewhat like rubbings of an Eraser. I use fingers only for application. Do you encounter foundation or undereye concealer flaking during application? Is this available in Singapore? Thank you for your great reviews.